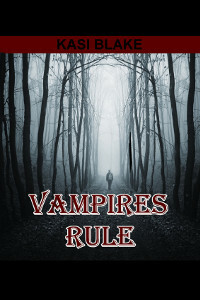 Unhappy as a vampire, Jack returns to his childhood home every year to take a look at what he’s lost. This year is different. A freak event restores his mortality and takes away his fangs. A second chance to be human. All Jack wants is to have a normal life, but what’s normal about a werewolf English teacher, a girlfriend who happens to be THE werewolf hunter, and a brother who can’t decide if he wants to welcome home his brother or stake him through the heart to be on the safe side? Being mortal isn’t as easy as he remembers. He struggles with school, making new friends, everything. Silver shares a secret she’s been hiding, something that could end both their lives. The head werewolf is in town, building an army to take over the world, and Jack is the only one who can stop him. When Silver tells him about the magic rock, that all he has to do is touch the werewolf with it, that doesn’t sound so bad. Then a complication arises in the form of a psychotic werewolf from Jack’s past. The magic rock only works once. How can he use it on the head werewolf when the one who murdered his parents is within spitting distance? Being human isn’t as easy as Jack remembers. Although he hates to admit it, he misses his powers. Then his new girlfriend lets him in on a little secret. She has a journal written by a faerie thousands of years ago, and that fairy had seen the future. Jack is destined to battle the head werewolf and save the world from an army of hairy beasts. How is he going to do it as a mortal? The faerie handed down a magic rock along with the journal. It can only be used once. Problem is Jack doesn’t want to use it against the head werewolf, a man who never did anything to him, especially not when he has another target in mind. The werewolf that murdered his parents is still on the loose. Jack has a choice to make. Will he kill a werewolf who might build an army, or will he seek his revenge against the one that took his family away?